This map was commissioned by the House of Commons for the ninth teport of the Post Office Management. The map's title features at top right, with an explanatory note and scale bar at bottom right. 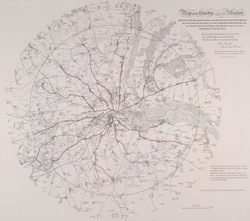 It shows the boundaries of the London Two-Penny Post, and the old and current boundaries of the Country Three-Penny Post, with mail routes highlighted in red. Post stages on the edges of the post area allowed mail to be exchanged between the London and the General Post on all main roads out of London.